Don't Starve is a game that has death on its mind. The developers at Klei are known for their hand-animated 2D style, but where other games look more like a Saturday morning cartoon, Don't Starve presents itself with a much more grim style. The opening cutscene's subdued colors, skritchy-looking pencil lines, and the question as to whether the protagonist is crazy or if his radio actually was talking to him, immediately sets the game apart from their other works. And when he wakes up in another world, being warned that it's going to get dark soon, it feels like the game hasn't given you a goal, so much as started your inextricable march towards death. Don't Starve's art style, animation, even sense of bizarre, gallows humor are definitely the best things about the game. Unfortunately, that grimness doesn't really come together to add much in the end beyond the aesthetic. And for as cool as everything looks in the game, there's no feeling of like wonder when you're exploring around. It's just kind of dull and grey and after you get used to what you're seeing, there's nothing about the way that the procedural generation works that gives you something new or exciting to run into. 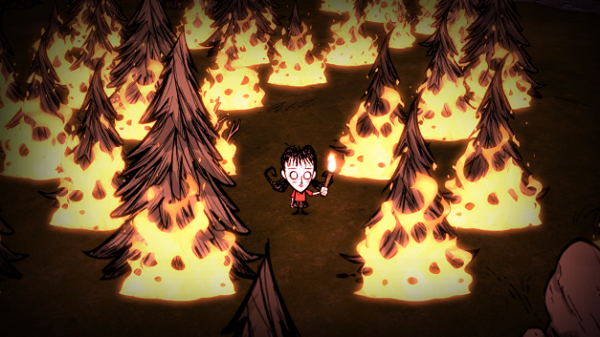 Through being exclusively single player, Don't Starve also walks a weird line most other popular games in this genre don't: it has an adventure mode with a story and an ending, but you will be going through it entirely alone. There isn't the fear of someone running in to kill you unexpectedly or the joy of working with someone to survive in the wilderness. It's just you alone in the grey wildlands. It makes it so that game is easy to get to the point where you can survive well, but then gives you nothing to really push yourself towards if you're just in survival mode. 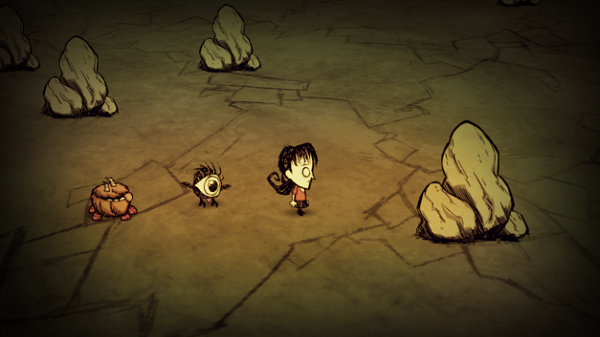 The thing is that Don't Starve didn't encourage me in any way play any of the parts it had to offer. It wants you to explore, but it also wants you to survive. The best ways to survive are to set up a shelter and farm, the first level of Maslow's needs met, but then you're not seeing the world, and seeing the world mostly offers a lot of the same dead-looking biomes, as well as making survival more difficult due to a possibility of running out of resources. Games are often based on that kind of give and take, of course, but the tradeoff has to be worth it, which I certainly didn't find to be the case. And of course one of the maddening things about Don't Starve is that I could just be missing something-- it's a game that trades on vagueness and allowing the community to figure things out for themselves. Even the manual proclaims this, so if you open it up looking for even a small point the in the right direction, that's too bad. And this is where the game's failure to hold me in other regards came around for the final blow. Since the world and systems didn't engage me, why would I even want to try and figure this out? While I've certainly found these kinds of obfuscations engaging in the past, I felt those games earned it in a way I didn't feel about Don't Starve. I came into the game extremely excited for it, and the gorgeous animated opening did a lot to get me hyped, and while the surface parts remained cool, it didn't reveal much more for me to enjoy. All rushes of enjoyment the game gave me then turned into a long slide into boredom until I had to just go "well... I'd better find something to entertain myself then." Eventually I just ran out of interest for doing that. Beneath what I had originally found so interesting I found a game frustratingly vague, that held for me no wonder, nothing that drove me to want to explore or survive. It's a game that needs the player to be thrilled by the challenges of surviving as you explore and I didn't find these aspects to be enough for me. The drive to come back was never there, the interest in maintaining of building a world. Dead lands, dark creatures, monsters lurking in the dark, it's a game obsessed with the look of death but nothing to say on the matter. It wants to kill you. And I don't enjoy the way it tries to do that. It's simplistic jumping on levels for time trials, or it's overly-chaotic racing around the same platforming levels. It's not like the WiiU is hurting for good 2D platformers that you can play instead. Nintendo put their best foot forward in developing a new franchise. This is a solid port of a solid survival game. It doesn't have the same crafting depth as other games like Terraria or Minecraft but it does a fine job by giving a survival experience like nothing else. For a third of the price of the main game, you essentially double the length. You get a whole new slew of 80 levels that takes about as long as the main game to get through, and has even more to do because it's just so amazingly difficult. While some of the visual elements feel a little pasted-in, New Super Luigi U adds enough fresh things to an already excellent base game to be more than worth your time. It may have come out of nowhere, but Scram Kitty and his Buddy on Rails is great, a surprisingly fun and unique game. The presentation may be a little no frills, but the game is a good mix of platforming, shooting, and puzzle solving, fast paced and challenging. It's smartly designed, and while I wish there were more modes, what's there is definitely worth experiencing.